In 1-cup microwavable measuring cup, microwave 1/4 cup of the milk on High 10 to 20 seconds or until 110°F to 115°F. Stir in yeast and 1/2 teaspoon of the sugar. Let stand 5 minutes or until foamy. In 4-cup microwavable measuring cup, heat remaining 2 1/2 cups milk on High 2 to 3 minutes or until 120°F to 130°F. In large bowl, beat warm milk, remaining sugar, the egg yolks, butter, vanilla and salt with wire whisk until well blended. Beat in yeast mixture and flour until smooth. In medium bowl, beat egg whites with electric mixer until stiff peaks form. Fold into batter until small flecks of white are visible. Cover; let stand 30 minutes or until batter starts to rise. Spray Belgian waffle maker with cooking spray; heat waffle maker. Gently stir batter; spoon batter onto waffle maker. Close lid. Bake 4 minutes or until steaming stops and waffles are golden brown. 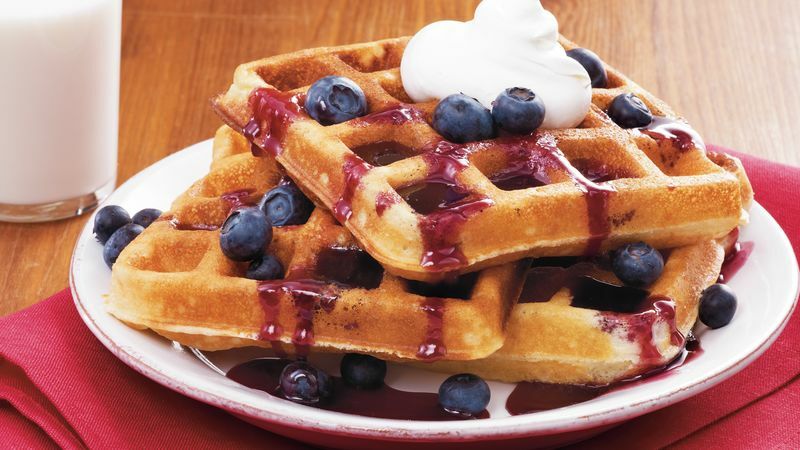 Serve with syrup, whipped cream and blueberries.